Range Rover Air to Coil Spring Conversion Kit for P38 Range Rovers! The EAS (Electronic Air Suspension) System found on Range Rover 4.0 and 4.6 1995 - 2002 model vehicles can present expensive, recurring maintenance problems. If you've had an air spring failure before, you know this first hand. Atlantic British's Range Rover coil spring kit is the industry standard that makes switching to coil springs seamless and error-free. Thousands of these Atlantic British kits have been installed worldwide - don't settle for lesser imitations! Conversion to coil springs provides a better, maintenance-free ride that will save you significant money over time. Our EAS Override Wiring Harness suppresses all typical false dashboard display errors seen when converting to coil springs. What's more, any mechanic or Range Rover owner can install our exclusive Range Rover coil spring kit without having to go to a Land Rover dealer or Autologic-equipped repair shop to eliminate false dash warning light errors. Atlantic British Ltd. Video: A brief overview of the Air-to-Coil Suspension Conversion Kits available for many Range Rover models. 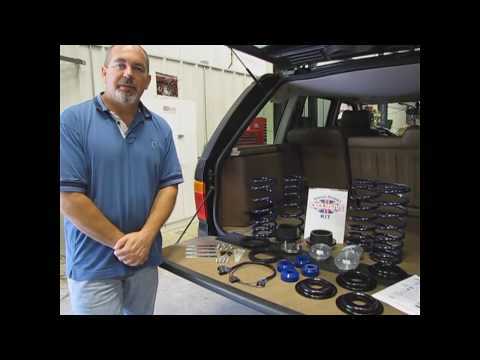 If this is something you have been thinking of installing on your Rover, watch this video to learn how to get started. Questions about this video? Call us at 1-800-533-2210 or contact us via live chat.